Posted 3 years, 8 weeks ago. Today’s episode of Mobile Couch is basically the story of my experience using JetBrains’s AppCode in the last few weeks. I had so many notes for the episode (which seriously never happens, I’m lucky to have half this on a normal episode). So I figured, hey, why not throw this up on my blog? This is by no means a COMPLETE review. I tested under my typical working conditions, as part of my “normal” workflow, which differs from person to person. If any of these features sound enticing, I suggest downloading the trial yourself and using it for at least a week. Your experience might be different! Posted 3 years, 20 weeks ago. The last iPad I purchased was the original iPad mini. When I got it, I was excited by the prospect of having a smaller device that would be easier to carry about; given that its size is roughly equal to some of the (paper) notebooks I already carry around, I thought it might be a better match for me than the 10”, 3rd-generation iPad which had preceded it. As always, however, my excitement over new tech subsided and I discovered that I used it less and less. Now that I’ve had my iPhone 6 plus for over a year I’ve realised why: what I really wanted was a device that was both iPhone and iPad. One device to rule them all, so to speak. This, I think, has always been iPad’s failing point: the ecosystem is so similar to iPhone’s that many will find themselves questioning the need for both devices. As soon as that question rears its head, the battle is lost. Obviously, the exception here is the iPad’s screen. Being as large as it is, it should make the device an excellent illustration tool, but I always found the experience ever-so-slightly lacking. The styluses have always felt imprecise, and palm rejection has never been amazing. This made drawing with the tablet feel like drawing on a whiteboard, which isn’t something I necessarily enjoy. My decision to purchase an iPad Pro was reluctant to say the least. I obviously have no love in my heart for the iPad, but the idea of the Pencil brings its own excitement, albeit a cautious excitement. My track record with iPad styluses so far has been lacking, so would this be any different? Is the iPad even capable of being a device for professional illustration work? I decided to buy one and trial it for a few days before I really made my decision. I mean, I could go into the Apple store and try one there, but I didn’t feel like I’d really be able to grasp the limitations without using it in my regular workflow, which I can’t do in-store. If all else failed and my fears were warranted, I could simply return the device (Apple’s return policies are quite amazing), and never look back. Posted 3 years, 41 weeks ago. A large part of creating software is versioning. That in mind, versioning with Xcode has always been — and continues to be — a pain. Now that iOS supports frameworks and extensions, it’s only getting worse. Though undocumented, it’s suggested that all of your targets have the same build and version numbers. 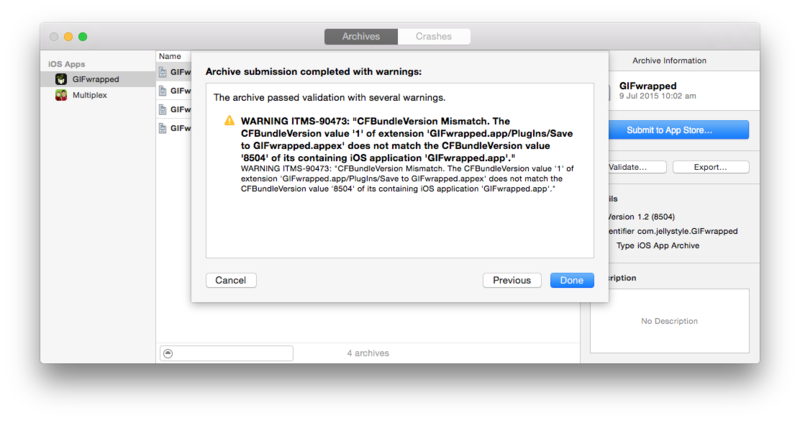 It doesn’t stop things working, but you will get a warning when you submit to the App Store. So off you go, trundling through your targets, updating your version number so everything matches. Not ideal, really. Posted 3 years, 49 weeks ago. Ok, so far we’ve taken our recordings, cleaned them up, cut them up and managed to get something edited. Good job, everyone! High fives all around! We’re in the final stretch now. The next bit is taking the audio from Logic Pro X (or your editor of choice) and getting something resembling an MP3 to release. In Logic, this is called bouncing, and even though you could just bounce an MP3 from Logic directly, I do just a little bit more work to make things just right. Obviously, parts of this process will vary from editor to editor. I’ve not used a bunch of other editors, and really this is just my process. Your mileage may vary.